Whether selkie isperceived by readers as light-grey or light-blue tends to depend on their monitor settings. I always thought that Her color was periwinkle. Which is relatively close to periwinkle (R204 G204 B255), though a bit darker and with just a hint of green. I wrote a story once where aliens had purple blood. My explanation was that they started off with hemocyanin and eventually evolved hemoglobin because it was more efficient, but kept on to the redundant system just in case. Why would the blood color matter? White people, black people, yellow people, and albinos all have red blood. Does not effect their skin color. Blood here on Earth is iron-based. Iron is red. They explained Spock’s green blood as “Vulcans are copper-based”. Maybe Selkie’s species is zinc-based? Or magnesium? Maybe lead or silver? Some OTHER mineral than iron. The color of our skin takes a higher importance than the color of our blood it’s true. However, it’s not unreasonable to say that other creatures don’t have the same chemistry in their skin as we do and thus their blood changes how their skin works. She might have cobalt based blood or something along those lines and it reflects in her skin. Actually, your blood /does/ help color your skin. But since we all have the same color blood, it’s not like there’s room to compare, say, medium brown skin with red blood against medium brown skin with blue blood. We do sometimes have people with blueish /skin/ over red blood due to metabolic saturation of silver resulting in Argyria. That can turn out almost Selkie-esque. Unless Dave wants to simplify and say they have hemoglobin red blood and are just naturally tanked up on silver which they use to help conduct their mysterious green energy. Working as a cashier, I met a man who had blue skin and blue eyes, as in the whites of his eyes were blue. I didn’t ask why, but I remember it being incredibly startling making eye contact with him. Right. 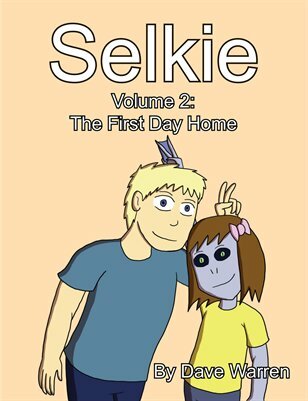 Forget the monitor settings Dave, I’m sure I remember Selkie saying in one comic she was periwinkle. That trumps reader perception every time. Probably due to the lighting and the fact that he considers Selkie a human (the default species) he sees her skin as grey instead of periwinkle. ME TOO! Periwinkle for the win! I remember the periwinkle comic too. Perhaps the barista is colorblind? As if those weren’t already smashed by Selkie’s appearing. I love her face in panel 3. I like the way he is handling this. Yet more evidence that he will be a good parent. Rather than immediately jump down the guy’s throat, he a.) reprimands Selkie for yelling, and B.) calmly explains the situation to the man without acting like he was offended or anything. I’m surprised Mina is so embarassed. This *is* an important thing for Todd and Selkie to be able to deal with: what to tell people who’re concerned about her Odd Appearance. Not everyone will think she’s been pigging out on blueberries. Mina didn’t know she was getting Selkie that evening. Mina should have known that she would be getting Selkie as part of the whole package if she is really trying to flirt with Todd. Yeah, but even married couples with multiple kids find ways of being married couples with multiple kids, if you know what I mean. Todd and Mina need to go ask a couple with several children how they manage it. Remember, it wasn’t Todd’s plan to bring Selkie with him. He couldn’t find a sitter on short notice. Poor Mina. But as others here have pointed put, you date a single parent, you get the whole package. Even when the kid isn’t there, he or she is still “there”. And I find this a great and timely juxtaposition on the current Great Ebola Freakout. It fun to see Todd getting better at that lawyer speak… After all being a different species is an “inherited condition”. While I’m sure Todd is used to this, it would make sense for anyone else he were dating to be kind of embarrassed.. except Mina. She’s as familiar with the public reaction to Selkie almost as much as Todd is. I’m kind of surprised she’s not shrugging it off. I don’t think Mina’s issue is with the guy questioning Selkie’s appearance. I think it’s the fact that Selkie is making a scene in a place Mina likes to frequent. But I’m sure Mina has seen this exact situation happen to her before, including Selkie’s outburst. She looks different enough that what she looks like can’t exactly be chalked up to “sickness”. It’s like seeing a physically deformed person in public, or someone who has a chromosomal disorder. You wouldn’t ask them if they were sick- twice, before serving them. Especially if the person said they weren’t the first time. Not only should she not be embarrassed, but she should be well prepared for this line of dialogue, including Selkie’s outburst, because she’s seen Selkie go through much worse. People double-check what children say all the time. For good reason. How many kids will protest that they are not sick just to be allowed to go someplace they want to go? Most people can’t think of a genetic disorder which would make their skin a weird color. And Selkie didn’t say that, what she said was “I’m not sick.” The bit about “I haven’t puked in a week” from the previous strip would come across as “I was sick recently” to most people. Her father was sitting right there. Also he asked first, if she is contagious, which could be interpreted as name-calling (more than the question if she is ill). Terrible English, I know. Sorry. Geez, Mina, stop being such a jerk. She’s light blue-grey to me. No one’s commented on “Roast Darkness”? Truly, coffee has never sounded so EPIC: this must be the brew of choice for vampires and supervillains. Kudos to the barista for knowing how much “roast darkness” and “pasty breads things” are off the top of his head … on a somewhat related note, I think I know what I’ll order next time we’re in Starbucks. Hey, can I have a “Roast Darkness” to go? Great comic and I understand how cons go, they are all kinds of hectic. Thanks for trying to keep up with regular updates but unlike some webcomics (not dropping any names! ), we’d know that you would be back on the following update if you did need to do a filler. That is why your comic is one of the best. BTW, you might want to look into the Comic Chameleon app, you just submit an application and from what I read, it’s free to join! That way, we can all enjoy our Selkie wherever we are! I see a color somewhere in the middle of blue, purple, and gray. If you’ve eaten something that tastes bad enough to induce throwing up, do YOU stop to think that? No, but if your entire species does, you might stop to study it. It’s really odd. I can think of no other obligate carnivores that reflexively regurgitate plant matter. Dunno, our cat seems to do that pretty reliably. I want some roast darkness too!!! I’m going to go with bluey purplish grey.